Beauty Professor: Beauty Professor + Neiman Marcus Beauty Event on 9/18/13! 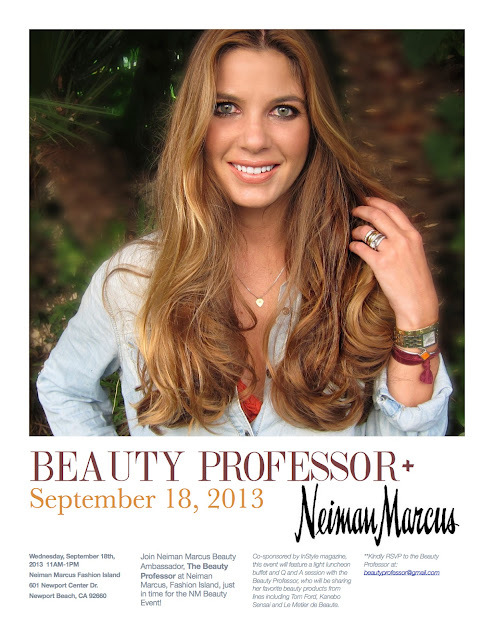 Beauty Professor + Neiman Marcus Beauty Event on 9/18/13! You are cordially invited to the first ever Beauty Professor event at Neiman Marcus at Fashion Island! What: A special beauty event, hosted by the Beauty Professor...the event will feature a light buffet, a Q and A session with product specialists and a spotlight on some of the BP's favorite Neiman Marcus beauty products! Above: Here's a sampling of the latest Neiman Marcus Beauty Event gift bag (packed with samples, I might add! ), which is free with your $125 beauty purchase. Bottom Line: I truly hope you are able to make it to this event...I am really excited to meet my local readers and can't wait to share my favorite products in this gorgeous environment. Neiman Marcus + food + beauty products...what could be better? Seating is limited, so please RSVP via email (beautyprofessor@gmail.com) by 9/16/13! Thank you!! I am truly excited as well. I so appreciate your supportive and encouraging words and hope your week is going well. I am sooo excited about your upcoming beauty event and all the fun that you guys will have. I wish everyone the very best for a night filled with indulgent product sampling, yummy food, gorgeous products and of course, fabulous discussion! Whilst I am unable to attend (curse the geographical distance)I will look forward to an update (and possibly some lovely photos) on your blog! PS: I finally received the Peau Verge and am thrilled to finally have the opportunity to incorporate it into my routine. I am using it per your recommendation and will report my findings after a trial period. I am enjoying using the Ceramic Slip Cleanser (no skin reactions- so yeah) and am loving the Tom Ford lip colour in Ravenous! Oh my...thank you!! This is the first event of this nature that I've ever hosted and I am super excited to be a part of it. Too bad that you are unable to come, but of course, I understand ; ) If only private jets were more accessible these days!! I will definitely make sure to take an ample amount of pictures for a future recap post...with specialists from Tom Ford, Kanebo Sensai and Le Metier de Beaute each making an appearance, there is sure to be a plethora of loveliness to document! What fantastic news about the Peau Vierge...it is such a special product! Please keep me posted on your experience and congrats on the SR and TF acquisitions as well. Ravenous is gorgeous! How truly fantastic and exciting, I would love to attend something like this but seeing I'm in Australia I won't be able to. I hope everything goes well and I'm sure everyone who attends will love it. Thank you ever so much! I am truly excited and wish that you were on this continent to swing on by ; ) Much appreciation for your well wishes...I will make sure to do a follow up post for the event. I am so proud of you, this is just awesome. Can't wait to see you! Thank you so very much...you are too sweet, indeed! Can't wait to see you there as well! Oh my Lynn...thank you ever so much! I wish you could be there as well...it would be such a blast to meet in person and revel amongst the makeup together. I know my mom will be in "documentation mode" and I will share a recap of the event soon! I really wanted to be there, esp since it is my birthday, but I have an emergency dental appt at 1230 so there simply won't be enough time before or after to make it to your event. I am so bummed! Good wishes, I am sure it will all go wonderfully well! I so wish you could have come but completely understand that sometimes a pressing situation must take precedence! You'll be missed! I hope that, despite your dental appointment, you have an absolutely wonderful birthday today! Take care, xoxo and talk soon! Well, it would be lovely to meet you and visit the live event at NM however, I am in SC and cannot get out there at this time. I have been viewing the event online and trying to make my decision for purchases. Seeing your post, I wonder if you would list the ingredients from the Kanebo Sensai Collection Cellular Performance Wrinkle Repair Cream. I am in the market for a high quality wrinkle repair cream and your post came in time to consider this item. Thanks so much! And I do enjoy reading your blog. Thanks for your kind words...it would have been wonderful to have you at the event, but alas, South Carolina is not around the corner ; ) I will post the Kanebo Sensai Cellular Performance ingredients in my updated Kanebo Sensai skincare post which went live earlier this month. I adore this cream and highly recommend it! I hope this this helps...thanks for being a lovely reader and have a fantastic rest of the weekend!